An interface to the cycle routing/data services provided by 'CycleStreets', a not-for-profit social enterprise and advocacy organisation. The application programming interfaces (APIs) provided by 'CycleStreets' are documented at (< https://www.cyclestreets.net/api/>). 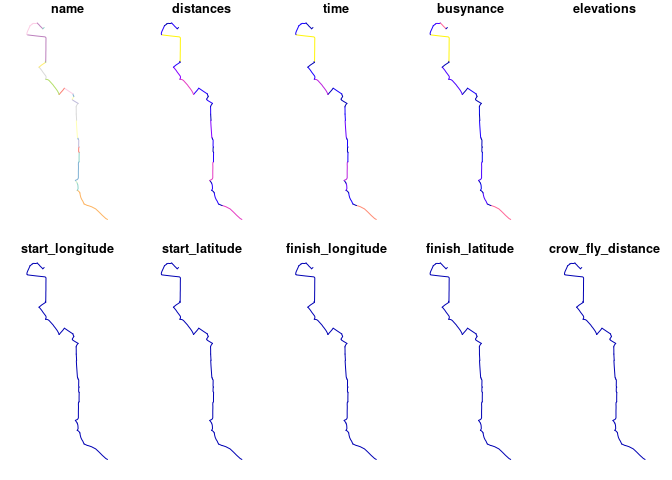 The focus of this package is the journey planning API, which aims to emulate the routes taken by a knowledgeable cyclist. An innovative feature of the routing service of its provision of fastest, quietest and balanced profiles. These represent routes taken to minimise time, avoid traffic and compromise between the two, respectively. The goal of cyclestreets is to provide a simple R interface to the CycleStreets.net routing service. It was split-out from stplanr for modularity. Route types available are: fastest, quietest, balanced. See help pages such as ?journey and https://www.cyclestreets.net/api/ for details. Update package description, title and other things in preparation for CRAN submission. New argument cols added to journey() function allowing control of the output. Many more columns can now be accessed as illustrated by new example: journey(from, to, cols = NULL). Package created as part of the R for Transport Applications course at the University of Leeds.